I've been busy searching high and low for a nice light fixture for our dining room. As I stated in my original post about moving to Chicago, I want the majority of all our decor to come from a second hand source. Buying second hand is great for the environment and it also makes room for some budget friendly creativity. I love one of a kind items that won't break the bank. 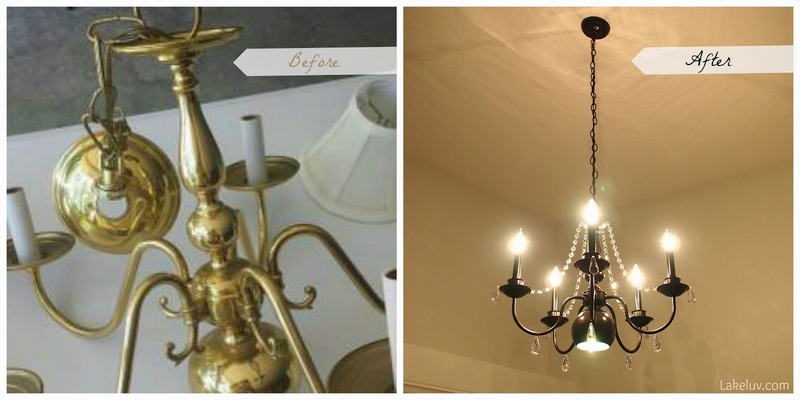 For this project, I started with a dated chandelier from the Habitat for Humanity Restore in Elgin, Illinois (Why so far? I was in Elgin getting my new Illinois driver's license and the Restore was close by and it was a nice respite after the 4 hours I spent at the DMV). First I made sure that the chandelier was working and that it had all it's parts, then $15 later, that baby was in the back of my car. I gave it a good cleaning with a damp rag and scrunched up tape into the light tubes to make sure the electrical components didn't get a spray of paint. You can choose to hang your chandelier in a well ventilated area (from the rafters in your garage if you have them) or just place it on some newspaper, making sure to keep rotating after each side has dried. I totally forgot to take a photo of that step, sorry! I used a $7 can of Rustoleum Metallic paint spray in Oil Rubbed Bronze to get the look I wanted. I know it looks black in the photo, but it really has a beautiful bronze sheen in person. I gave it about 2 coats, and didn't use a primer or anything. Once the paiting was done and dry, it was ready for some bling. I ordered 6 feet of glass crystals from Amazon for about $15 with shipping. I got about 5 feet when I actually measured the garland out, but that was just enough to separate into 1 foot strands for each of the 5 arms. I also bought a bag of clear acrylic tear drop crystals for another $12. I really wanted to use glass or real crystals, but I had a hard time finding a full set of vintage ones, and the new ones are way too expensive for what I had budgeted for this project. To attach the crystals, I used a 20 gauge colored copper wire that I bought for 4 bucks from Michael's. First I separated the crystal garland into 5 even length strands. Then I fed the crystal strands through a 6 inch piece of wire and made a loop. Take that loop over to the chandelier and twist around the top of the fixture. Keep your loop wide so that the crystals can move towards their respective chandelier arms. Spread out the crystal strands and now you can attach each strand to each arm using a new piece of wire for each arm. Next came the acrylic crystal, and that was easy as well. Just take a small piece of wire, thread it through one crystal, create a loop, then attach to the base of the light. I also added the cystals to the curved arms of the chandelier as well. I'm super happy with it. Though now that it's done, I would love to eventually put a round metal cage around it to make it look like the Restoration Hardware Iron Orb Chandeliers I've been eyeing. From start to finish, this project was only around $55 and I got to save an old brass light fixture from making it to the landfill.